Great adaptation and skin comfort. 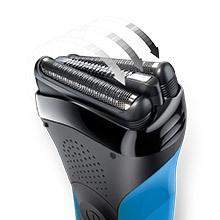 Braun is an iconic German brand specialised in world-class precision shavers. It is globally recognised for its simple, intuitive design and outstanding product performance. 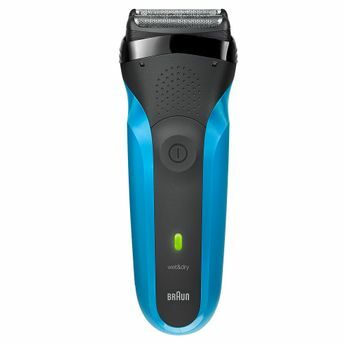 Trusted by men everywhere, Braun is the world?s #1 foil shaver brand. *All Braun shavers go in straight, intuitive strokes so you don?t need to circle over the same spot twice, helping to minimize skin irritation.The specialised cutting elements are pressure sensitive and protected by a patented metal mesh (SensoFoil?) for a clean and close shave with outstanding skin comfort. All Series 3 shavers are designed and engineered in Germany for ultimate precision and attention to detail. Quality you can feel every day. *Based on value share from July 2015 to June 2016. Source: Leading market research institute. 3 specialised shaving elements work together for a close and gentle shave. Braun?s patented SensoFoil? protects your skin from the ultra-sharp blades. 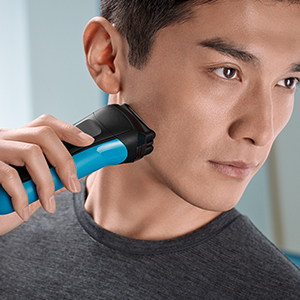 Braun?s pressure sensitive blades automatically retract to protect your skin. For a gentle shave and smooth skin feeling. 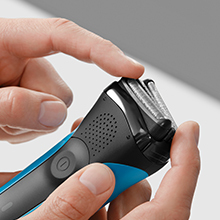 Intelligent design -The full shaving power of the Series 3 is built in a super thin head, allowing you to reach difficult areas like under the nose with ease. German technology - A Braun Series 3 is built to last. An ergonomic grip ensures you can shave safely, even with water, soap or gel. 100% waterproof - All Braun shavers are waterproof up to 5 meters. You can conveniently rinse them under running water for easy and hygienic cleaning. Shave wet or dry - You can use the Series 3 with water, foam or gel for even better gliding and a smoother skin feeling. Plus with Series 3 you can even shave in the shower. 2x long-life batteries - Two powerful NiMH batteries with quick charge technology. Just 5 minutes charge is enough for full shave.